← MA3-spa carb pictures, Wagabond notes. Built by William Wynne? Built according to The Manual? 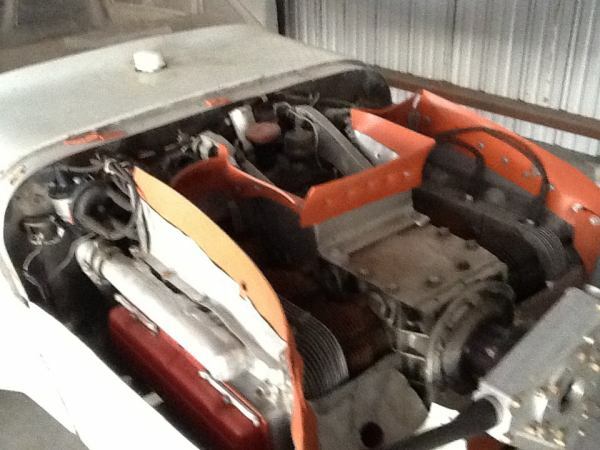 Below are photos of three Corvair engines. All of them were sold to new owners this year. The sellers of these engines said things to get the new owners to pick them up, things that we will just call “Less than honest.” One of the engines was said to have been built by myself; another was said to have been inspected by me, and successfully flown; the other was said to have been built “according to the WW manual.” Let’s look at why these statements are not accurate, and at the end I am going to make some serious suggestions about shopping for second-hand engines or engine projects. He was a great guy, and I spent a fair chunk of time with him. He was a “regular” at our Edgewater hangar. But this doesn’t mean that the engine he built was airworthy nor worth buying. Plenty of things are wrong with me; in many ways I am an opinionated jackass and I have made plenty of mistakes in life. But here is something that I do correctly: When a veteran aviator in his 80s shows up at my hangar, doesn’t have a medical, is pretty much aware that he isn’t going flying, and just wants to enjoy himself by exercising some creativity and building something with the hands that still bear the scars of shrapnel from an 88mm shell fired 60 years before, he gets the red carpet treatment. I am not there to lecture a man my father’s age that he is “Doing it wrong.” It is my task to make that man’s day a little brighter and do anything I can for him: Tools, time, coffee and being a good listener. If a 35-year-old guy came to a College and wanted my help to build and run the above engine and then put it on his plane, the answer is of course “No,” and I am going to make Mr. 35-year-old do it the right way, because he is going to take it flying, and he didn’t sacrifice his youth in 1944 trying to do something to stop fascism. Most aviation companies wouldn’t let a guy like Sam hang around any longer than it would take to find he didn’t have a lot of money to spend: “That’s just good business.” To hell with them, they may be business people, but in my book they are not aviators and they are piss poor Americans if they judge the value of men like Sam by the thickness of their wallet. This country is filled with people who think that having a yellow ribbon sticker on their car that says “Support the Troops” completely fulfills the obligation. Back to the main point: Look at the photo above. It has no 5th bearing and the crank probably isn’t nitrided. Look at the rust on the hardware. Do you think this was stored wrapped up in a really dry place the past 7 years? The guy who sold this to its current owner said that it was “Assembled by WW for Sam Sayer,” and was selling it for many thousands of dollars. I didn’t build this engine, the guy just said that because he is a B.S. artist who wanted to make a buck. Trust me, he isn’t the only guy like that selling something in aviation. Above, rear view of the engine: I have not put a rear starter on an engine in 14 years. Note there are no rear tins. 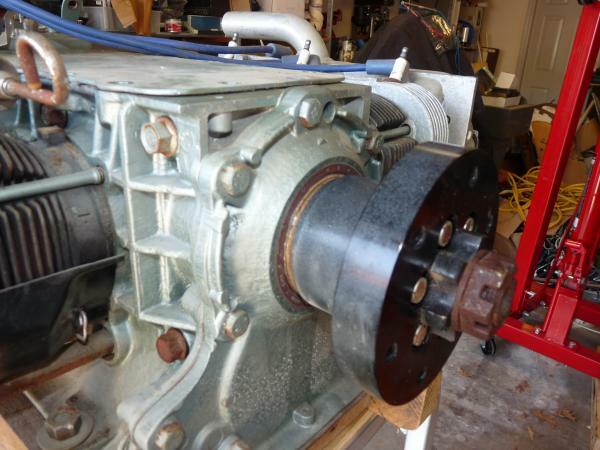 I have never put a belt driven alternator on that side of the back of an engine; search the name of my friend “John Blackburn” and “V-6 Ford crash” on my www.FlyCorvair.com Web site to find out why. The valve cover clamps are on backwards, the distributor clamp is the wrong one, none of the accessory brackets are strong enough. I have no idea what is inside this engine, I didn’t build nor assemble it. What I did do with the builder was spend two Veterans Days in a row with Sam in my hangar, treating a great guy with the respect and camaraderie that he deserved. 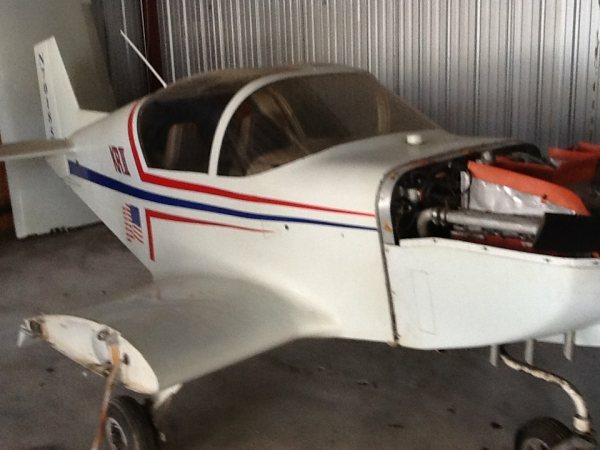 Round Two: Above is the KR-2 built by David Dergins in Florida circa about 2002. I saw this plane in a housecall, and was very concerned that it would crash on the first flight. Dergins was a very friendly and successful real estate guy, and he had the money to do a good job, he just didn’t have the patience. I told him it needed to be redone. Several months later he brought it to our hangar at Spruce Creek on a trailer to “Show Me” that he had taken my counsel seriously. He had not, and he stated he was going to fly it that week. Kevin, Grace and I had a real dilemma; we had no power to stop him, we were all pretty sure it was going to be an accident, and Dergins had already shown that he wasn’t going to listen to advice. We were looking at a bomb that was going to destroy a lot of the reputation of Corvairs that we had worked to build, we had no way to defuse it, and after it went off, we all knew that few people would understand that we had really tried to defuse it. I had already been in the engine business for 10 years at that point, and I knew the story would be “And Dave, that wonderful craftsman, had it up at WW’s hangar just the week before for his approval.” Dergins took it home in anger, and later said that he did get it off the ground, had problems on rotation, did a very low 180 and said he would never fly it again. He said to me several times that I was wrong, it did “fly.” By a miracle, the bomb was a dud. It was as if he had fashioned a suicide vest made to look something like a clothing line we sell, but at the last moment, it didn’t go off. Above, Dergin’s engine. Look at the front cover and compare it to Sam Sayer’s. Sam had craftsmanship but little money, Dergins had money but no craftsmanship. To settle the academic debate, I would rather fly Sam’s engine, but in reality, no one should fly either. Just get a look at the intake logs on the head. Yes, this engine will run, but cylinders 5 & 6 will run super rich, 1 & 2 will run very lean, and the head gaskets will blow in a few minutes of climb. The seller of this aircraft represented it as a KR-2 in flyable condition that has a WW inspected engine. Factually true? Yes, if you get into legal debates such as “It depends on what your definition of ‘is’ is.” For the rest of us, we can just say that the seller is not an honest man. I have spoken with the new owner, and he is a good guy who fully understands that every single part needs to come out of this and be looked at with a very critical inspection. Round Three: Above is the inside of a case of an engine that I tore down for the second owner. The guy who built it and sold it stated that it was built according to my manual. I ask all the reasonable builders to show me the part in my manual that tells builders to overspray all the rotating engine parts with orange paint. This was under the bearings, down in the lifter bores, and in the oil galleries. I guess he didn’t want the inside of the aluminum case, bathed in oil, to get all rusty? Looking at the engine, and reflecting on my communication with the orignal builder, I will tell you that this engine wasn’t a budget nor a craftmanship problem, it was an attitude problem. Specifically, the builder didn’t like taking advice from someone whom he perceived as a long-haired, opinionated, know-it-all, punk kid from Florida. First, I do have long hair, live in Florida, and I am a jackass, but even if you hate me, that doesn’t invalidate my words on engines. Maybe now that I am 50 years old we can put the “He is too young to know a lot about planes” crap to rest. I may not know every single thing about engines, but comparing my understanding of Corvairs with this builder, I am Albert Einstein (and I have the hair style to prove it). Above, a piston assembly out of the engine. That’s not just a cast piston, that is a Chinese-made cast piston. That symbol, just ahead of the wrist pin, is “Genuine Brand,” a massive, low quality Chinese engine partmaker’s logo. Their Web site says they are ISO-9001 certified, but this is taking the word of people who claim Mao Tse-tung was a great humanitarian, and that everyone in Tibet welcomes the 50 year Chinese military occupation of their country. 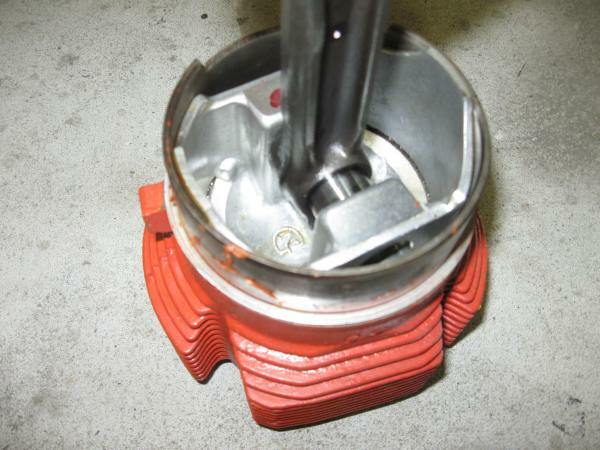 When I say that every flight engine needs forged pistons, it goes without saying that you don’t consider using cast ones from a communist police state. The engine had many such “features” inside. Every single one of them was the result of the original builder saying “This will be alright,” or “This is just as good.” Often the justification for going against the experience I share falls into two categories: The builder doesn’t like me personally, or he is going to “show me” what he knows. Neither of these are good motivation for taking a detour from what we know to work. Most often, the people who have decided they don’t like me have never met me. Out of 2,000 pages of written information on our Web sites, they have found a few sentences that they deem offensive, or they got set off by the moniker “The Corvair Authority,” or they thought the words “The Corvair movement” sounded like some hippie commune. From that point forward, they decided they were justified to selectively reject information from me that didn’t validate their existing mindset. That’s how you get cast pistons from China in a flight engine. Know this: If I threw away everything I learned about airplanes from people whom I didn’t find charming, I would know about 50% of what I do. Just because you don’t want someone like me for a son-in-law, that doesn’t invalidate what I have to say about Corvairs. Second, I have encountered many people who were going to “show everyone” something, namely how wrong I am on some topic. This is very poor motivation for anything that is potentially as dangerous as flying. Usually it is just a waste of time and money, like when a quitter named Robert Haynes told everyone on the Net he was going to show everyone the things I say about EFI are wrong. (He never even made the engine run, far less fly.) But it is also a very dangerous motivation, and it played a role in the fatal accident of Steve Jones, a great guy, but a hyper-competitive person who always falsely believed that everyone around him was judging his efforts. I have a handwritten letter from him saying that he was going to have the fastest KR-2 or die trying. His accident was testing CG locations, but I hold that his attitude on “showing everyone” was the underlying cause of it. If you ever detect that you are about to do something in aviation that you normally wouldn’t, but some part of you wants to impress others, just stop. Just stop. 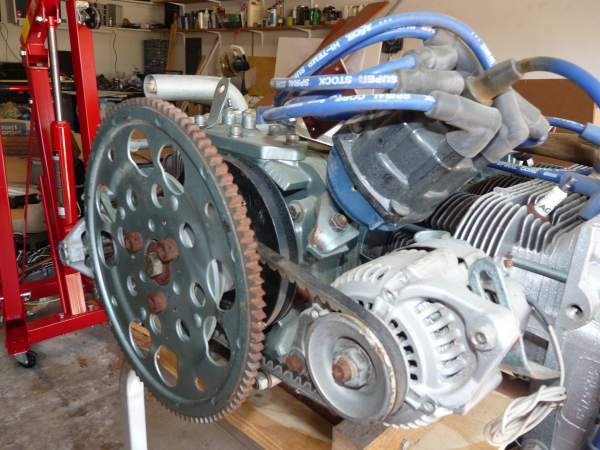 In summary, don’t buy a second-hand engine, no matter what anyone tells you about it. The average asking price of the engines above was more than $5,000. Sound like a bargain? The motivation to get a deal or a running start is not valid. 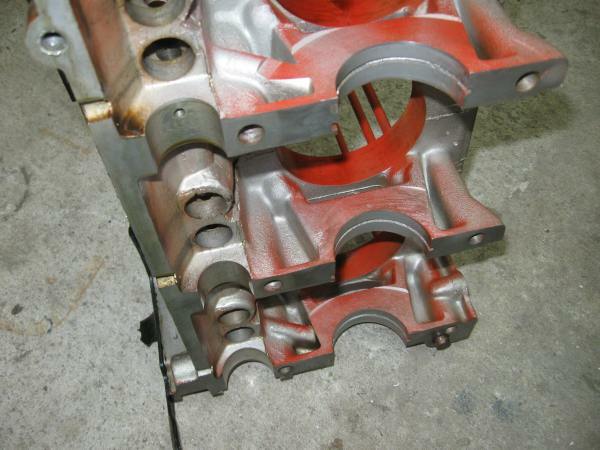 You are not in a contest to see how cheap you can build an engine, and you are not in a race either. Both of those mindsets come from day-to-day life outside of building and flying. One Response to Built by William Wynne? Built according to The Manual? Just love reading your articles and love your sarcasm. Thank you! By the way you are certainly not a jackass! Great perspective. Hope to shake your hand one day.